This is a rarity: A site which used to be brilliant but is now awful. Nowadays, Tango market their site at students acting like dicks. But they used to aim it at geeks like me. And not only that, geeks with exactly the same taste in retro games as me. Yes, in 1990 Tango used to base their site around a shameless rip off* of Jet Set Willy – the greatest game of all time. The game itself is sadly not archived, but here’s a few screen shots. *There’s a chance Jet Set Willy’s Matthew Smith got royalties, but knowing what marketing companies are like, I doubt it. This entry was posted on April 1, 2010 at 1:27 pm	and is filed under Tango. You can follow any responses to this entry through the RSS 2.0 feed. You can leave a response, or trackback from your own site. 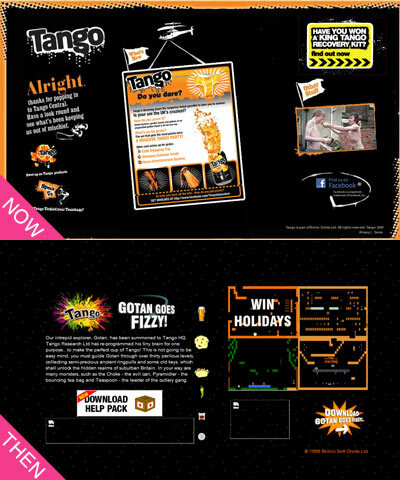 I remember one early incarnation of Tango’s website; It had a bunch of quite convincing pranky-type activities that you could interact with, like choosing a message to flash up on the illuminated billboard at Picadilly Circus (you could pick from phrases such as ‘Tourists Go Home’ and something about pigeons being evil). You’d select the message, then get a ‘Please Wait’ alert, then a few seconds later they’d show a ‘live stream’ of your message on the sign (i.e. a crappy-looking mock-up). Another part of the site let you edit a database of Tango employees’ wages. This just brought back an old memory. Tango.com was the first website I ever went to. I typed it in off a can.